Boston Acoustics TVee 10 Soundbar System 31.5"Soundbar Only! The TVee One connects directly to your TV with a single cable. Optical, coax, and analog inputs with automatic selection allow you to easily connect any TV. I've tried to take accurate pictures above so you can see its condition. Up for your consideration: A Pair of Indoor/Outdoor Two-Way Speaker System made by Boston Runabout II in their original box. They appear to be new & unused. They include mounting bracket. Perfect for Patio, Boat or any outdoor use, Made in USA! Boston Acoustics. Optical and Coax Digital, and Analog inputs with automatic input selection. · Dolby Digital and Digitally Optimized Virtual Surround for realistic surround sound. (2) ½” tweeters and (2) 2”x 5” woofers. Boston Acoustics TVee 10 Soundbar System 31.5"Soundbar Only!. Condition is Used. Shipped with USPS Priority Mail. 4.5 out of 5 stars - Boston Acoustics TVee 10 Soundbar System 31.5"Soundbar Only! 2 product ratings2 product ratings - Boston Acoustics TVee 10 Soundbar System 31.5"Soundbar Only! Thoroughly inspected, cleaned and tested with new re-foams that sound great, crisp and clean! Nice grills and wood in good condition! Auction is for 2 speakers. They are blue tooth and can use batteries or ac adapter. 6 AA batteries per speaker. They have been tested and work. They are in very nice condition. Lot of 5 Boston MCS100 Stereo Home Audio Theater Speakers. Pre-Owned. Appears to sound good. The center is funded solely by the sale of donated goods. Hooked up to receiver and played music. Donated in normal used condition, scratches, screen dust, center has back pegs attached.B logo moves. Includes 2 speakers. Model: KSAH2000250T1M2. Color: Black. Very good condition. works fine. 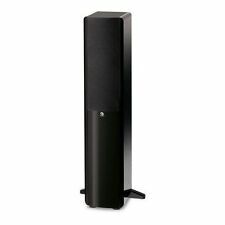 Boston Acoustics CRC Center Speaker. Excellent used condition. Boston MCS 95 5.1 Surround Speaker System Condition is Used System has been tested working and is guaranteed fully functional. Item has wear from previous use including scuffs, scratches. No additional accessories, paperwork, cables, or attachments are included. Item is on hand and ready to ship. Please feel free to message me if you have any questions. Perfect for rear surround speakers or even as LCR Speakers. 7" Boston Acoustic Speaker. heavy speaker shielded 8 ohms 150 watts i dont know the model number sorry Condition is New. 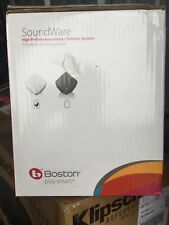 Boston Acoustics DSi453, 2-Way In-Wall / Ceiling Speaker, BRAND NEW! Boston Acoustics DSi453, 2-Way In-Wall / Ceiling Speaker, New,Never Installed,Removed From Box For Testing. recommended amplifier power 10-125 watts, nominal impedance 8 ohms, mounting depth (from surface) 2-3/4, crossover frequency 2,500Hz, tweeter 1", external dimensions 15-5/8 x9". mounting hole cutout 14-1/4 x 7-5/8", high performance 2-way in-wall speaker, dual 51/4" copolymer woofers, 1" kortec tweeter, uses NCBTL5 new construction bracket. Acquired in an estate sale. Has not been tested. See pictures for Details. Center Channel Speaker. Specs below. Sold in pairs, you will get two woofers. Buy one (1) and you get a pair of woofers. Boston Acoustics 4 1/2" Woofer (pr.). Boston Acoustics 4 1/2" Woofer, Fully Shielded Design with 1" Voice Coil. Four 3/16" screw holes,3 5/16" (3.34") center to center on the flange, or 4 3/4" (4.750") center to center on the diagonal. This is a pair of Boston Acoustics M25 in excellent condition, See pictures for condition. The cabinet also contains heavy-duty absorptive fill and internal braces which have been strategically positioned to maximize the speaker's strength and optimize sound. Tested and working. In good used condition. Comes as pictured. Boston Acoustics TVee 26 Wireless Subwoofer Power Cord Ships FREE!. Condition is Used. Shipped with USPS Priority Mail. Speaker was plugged in with and in-house power cable and breifly tested. Unit powers on and produces sound. No extensive testing performed. Woofer is in good shape. There are no cords or cables included. Minor scratches on exterior item will be bubble wrapped and Saran wrapped so the cushion does not become loose. Then boxed and shipped with 1 business day. Model DSi455T2. ManufacturerBoston Acoustics Inc. Product Line Boston Acoustics Designer. Driver Type tweeter driver, woofer driver. Speaker System Type speaker. Speaker Type speaker. SPEAKER SYSTEM. We cater to music enthusiasts and audiophiles, and we love what we do. We design audio systems for all budgets, from entry-level to high-end. Drivers - 8" (200mm) long throw with focused gap magnet assembly for low distortion. 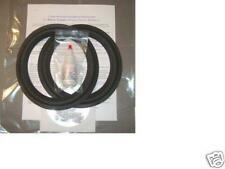 10-11/16 x 7-1/4” x 8-7/8” (271 x 183 x 225mm). High-Frequency Driver. Crossover Frequency. THESE ARE SHIELDED. Year: 1994. Weight: 7.3kg. Bass: 1 x 180mm. Sensitivity: 90dB. Stereo 6½" High Performance Stereo Outdoor Speaker. This versatile outdoor speaker can be used to play stereo from a single location when there is not room in the ceiling for a pair of speakers. Plays stereo signal from a single location. 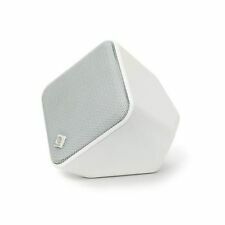 boston micro 80x surround speaker. Condition is Used. Shipped with USPS Priority Mail. This is a Boston Acoustic VR-12 Center Channel 3-Way Speaker (most center channel speakers are 2-way, reviewed as one of the best center channel speakers ever made). Crossover Frequency 500, 3300 Hz. Having the right speaker system can help transform your home into an entertainment hub, and finding a reliable audio brand to fill your home with sound is important. Boston Acoustics has been building great sound systems since 1979, and the audio company aims to make watching television and listening to music an enhanced experience. Boston Acoustics has a wide collection of speakers, sound systems, and stereos that produce detailed sound. What features affect a speaker's quality? In order to enjoy the sound quality, consider the different aspects of at-home speakers. Design: It’s easy to believe that the size of a speaker has a major impact on the quality that determines the initial frequency of a speaker system. Speakers use different components and multiple cones to help create an immersive experience for the listeners. Quality of material: The material of any system will ultimately determine how enjoyable the system is. The cone material, the wiring, the housing, and the glue also factor into the production of the stereo. Speaker quality is affected by materials that preserve audio purity and also free up the power of the frequency. Tuning: Every system will have a specific frequency processing mechanism that will determine the balance and performance. The tuning system can make good speakers appear bad, which makes it a fundamental component. Speakers should use powerful technologies to ensure that every speaker is properly tuned to produce pure EQ. Can you mix and match Boston with other speaker brands? Mixing and matching speakers with Boston is technically possible, but a scattered system may affect the dynamics of your surround sound. Every pair of speakers has a unique way it moves from one speaker to another. Combining different brands will impact how immersive the speakers are. Boston Acoustics uses technologies that are designed to work together to recreate the frequency at which movies and tracks were designed to be heard. Can you pair a Boston subwoofer with your current speakers? Subwoofers are more of a standalone speaker inside of your audio system. This means that a Boston subwoofer can be combined with any brand of other speakers. Boston Acoustics uses BassTrac technology to produce a powerful bass without the nuisance of distortion. This makes Boston Acoustics subwoofers an excellent addition to any sound system. Do you need more than one subwoofer? A single Boston subwoofer will be more than enough to provide your room with enough bass. 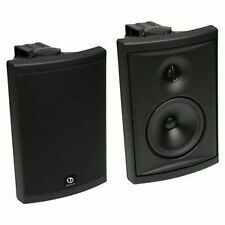 However, placing a second source of bass may help fill up and free the dead sound spaces in the room. Choosing to add another subwoofer is a question of personal preference. Content provided for informational purposes only. 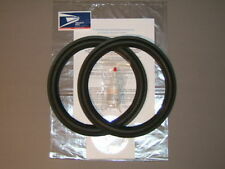 eBay is not affiliated with or endorsed by Boston Acoustics.